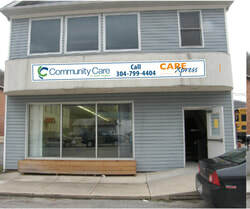 CareXpress is a comprehensive walk-in healthcare facility with a highly competent staff, which is standing by to offer quick, efficient assistance for all of your acute non-life-threatening illnesses and injuries. CCWV offers family planning services and participates in BCCSP. For children, immunizations are available through the VFC program and private insurances. CCWV partners with Pocahontas Pharmacy, in Marlinton, participating in the 340B discount drug program. In addition, CareXpress offers chronic care, on-demand, with no appointment necessary. Simply walk in during our hours of operation and see a provider for primary care.